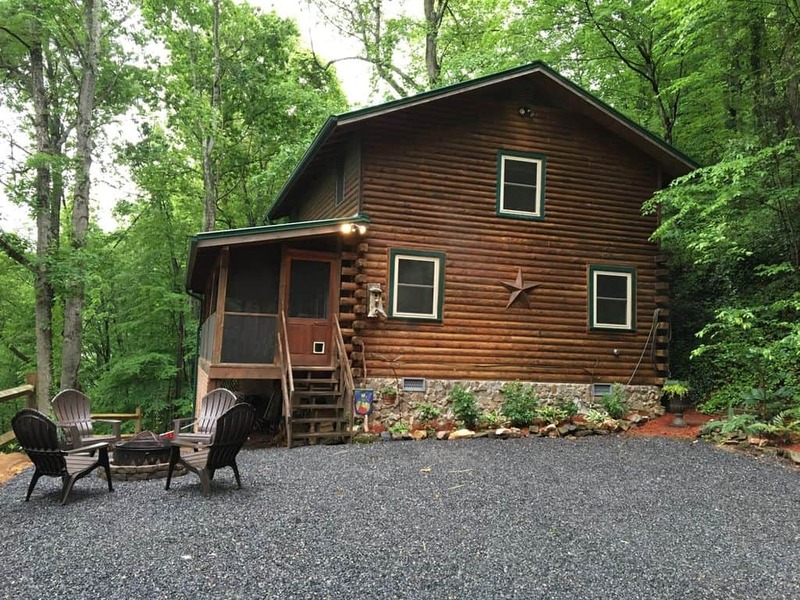 Enjoy the true mountain life experience in this two-story log cabin SECLUDED AND PRIVATE on the side of the mountain between Maggie Valley and Waynesville. Does it get more convenient than this? The cabin affords quick, easy access to the Great Smoky Mountain National Park. Our cabin is centrally located for any destination you have on your agenda. To the North 40 minutes is Gatlinburg, to the east 30 minutes is Asheville, to the South 30-40 minutes is Brevard/Highlands, Sylva, Dillsboro and Franklin and to the west 25 minutes is historic Cherokee and Bryson City and Fontana Dam. Perfect for any family get away. Sleeps up to six with a downstairs bedroom and a large upstairs bedroom that features two queen size log beds on each side of the loft along with a sitting area for TV viewing or just reading a book. And yes we have WiFi! A fully equipped kitchen, a charcoal grill, fire pit and a large screened-in front porch allow you the opportunity to enjoy your evenings at home.